The world's best interdisciplinary hackathon - Hacktech! HackIllinois is the primary hackathon at the University of Illinois at Urbana Champaign. Create software that reduces the risks and costs of sports injuries. CruzHacks brings together a diverse and inclusive group of students and professionals to develop innovative solutions to solve real world challenges. MLH Local Hack Day hosted by GitHub is back for our fourth year. Build your community with an awesome 12 hours of hacking. 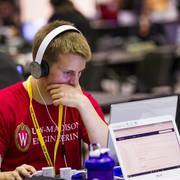 WildHacks is Northwestern Unversity's annual 36-hour hackathon. Hack for local nonprofits looking to make technological improvements. HackIllinois is the primary hackathon at the University of Illinois at Urbana Champaign. This year, it returns as the first Open Source Hackathon from February 24th-26th: hackillinois.org. Twin Cities Hackthon hosted at the University of Minnesota!